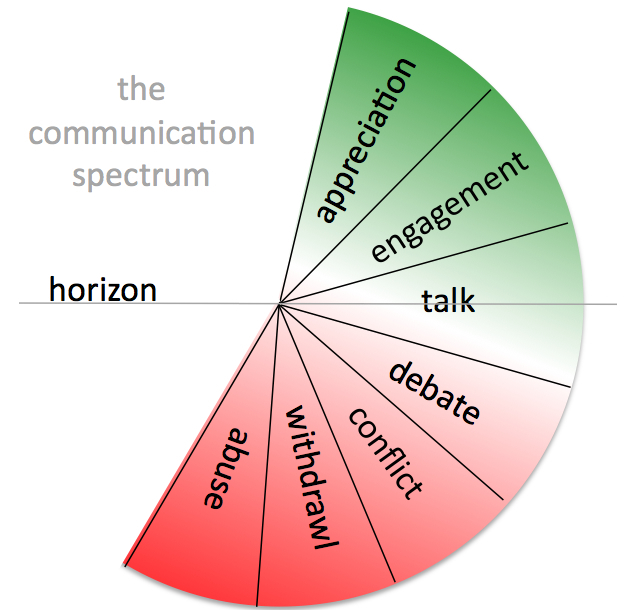 Engagement and appreciation are dimensions of the communication spectrum (introduced in part one of this series). Fostering them will improve communication generally and better equip your organisation for stakeholder engagement. Part three looks at appreciation. Genuine and heartfelt appreciation is at the apex of communication. It facilitates our relationships, building enduring bonds. It’s a potent antidote for complacency and rejuvenates long-term workplace and personal relationships. The TV series “Undercover Boss” exemplifies appreciation. In a typical episode the “boss” – usually a CEO or owner engages in low-level jobs. They get to talk to a range of staff and use their engagement skills to establish rapport and get to know them on a personal level. The show finishes with the boss revealing their true identity and expressing profound and specific appreciation for the work these people have done, and, more importantly, who they are. I have seen both the U.K. and U.S. versions of the show and notice, that across diverse cultures, the responses are the same. The impact of appreciation and acknowledgement on the employees appears profound. Universal human emotions are common currency across the diverse cultures represented. And the experience invariably has a profound impact on the boss. “We who lived in concentration camps can remember the men who walked through the huts comforting others, giving away their last piece of bread. They may have been few in number, but they offer sufficient proof that everything can be taken form a man but one thing: the last of the human freedoms – to choose one’s attitudes in any given set of circumstances, to choose one’s own way” (pg 65 to 66). As people respond to the myriad things that can go wrong, the default mode of operation in organisations can be fault-finding and problem-solving. David Cooperrider and others advocate an appreciative approach. “…problem-solving approaches are notorious for placing blame and generating defensiveness. ‘They sap your energy and tax your mind, and don’t advance the organization’s evolution beyond a slow crawl’”. By contrast appreciative inquiry advocates that we look for what is working well and magnify it. This is akin to the idea that the racing-car driver is best to focus on the road ahead rather than the wall. 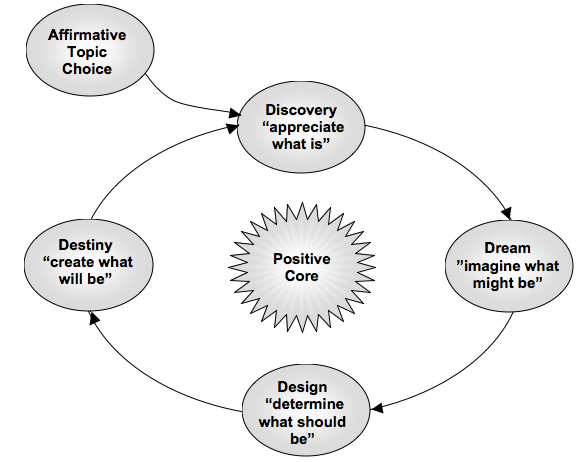 Appreciative inquiry can shape strategy or operations by selecting an affirmative topic, such as “where are our best examples of delivering a great customer experience?” and then working through the four stages of inquiry – discovery, dream, design and destiny (see below). Imagine the intensification of engagement and potential for positive change made possible by this process. I believe that engagement is the gateway to appreciation, or a pre-requisite (I welcome your thinking on this). In situations where peoples’ voice is not given space for expression, appreciation will be a rare commodity. 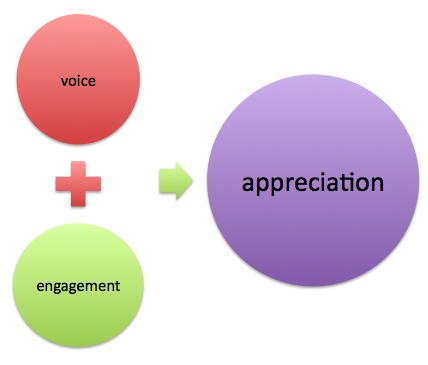 In many organisations islands of appreciation can develop amongst colleagues and teams in close (or virtual) proximity. The challenge is to make it more pervasive and immune to boundaries. And appreciation is not ingratiation. The organisation phenomena that fosters primitive “kiss up, kick down” behaviour creates the antithesis of appreciation. Check your filters – audit what you pay attention to in different situations. Notice what good/great/beautiful about a friend, loved one, contact or colleague. Express appreciation addressing specific behaviours or attitudes rather than general compliments. What has your experience of appreciation been – I would love to hear your story. This entry was posted in Communication and engagement, Stakeholder engagement and tagged appreciation, appreciative inquiry, communication spectrum, engaging, positive psychology, Stakeholder engagement, Viktor Frankyl by Peter Bruce-iri. Bookmark the permalink.